YoYoExpert Blog & Yo-Yo News – Amazing new Vapormotion colors from C3 & MagicYoYo! The VaporMotion combines the CNC skill of Magicyoyo and the design expertise of C3yoyodesign. It is a fast competition geared player with a C3 signature fingerspin cap design. They designed the VaporMotion with a polycarbonate plastic body and aluminum fingerspin caps for amazing weight distribution and endless fingerspins! 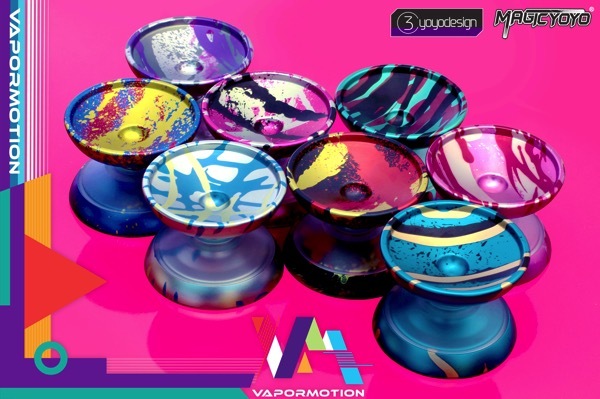 VaporMotion is approved by Team C3 Ethan Wong who is world famous for his fingerspin tricks. This yo-yo is no doubt a fingerspin powerhouse!